3 – Beginning Beekeeper Workshop: Gee-Price Building at Fuqua School, 605 Fuqua Drive, Farmville from 3:30pm – 6:00pm. Dinner included. See flyer for details. 3 – Brunswick Private Pesticide Applicator Recertification: Brunswick Extension Office from 6:00pm – 9:00pm. 4 – Virginia No-Till Alliance 2015 Winter Conference: Olde Dominion Ag Complex in Chatham, VA from 8:30am – 3:00pm. See flyer for details. 5 – Mecklenburg Private Pesticide Applicator Recertification: Sandy Fork Hunt Club from 6:00pm – 9:00pm. 6 – Blackberry Pruning Workshop: Cole Berry Farm, 3067 Ashbury Church Road, Vernon Hill, VA from 9:00am – 11:00am. 10 – Produce Auction Grower/Buyer Meeting: 1:00pm at the auction. 10 – Nottoway & Amelia Counties Buy Fresh Buy Local Meeting: Southern Piedmont AREC from 6:00pm – 7:00pm. 10-11 – Eastern Shore Ag Conference & Trade Show: Eastern Shore Community College, Melfa, VA.
12 – Dark Tobacco GAP Meeting: Midway Baptist Church, Phenix, VA at 9:30am. 13 – Beginning Farmer & Rancher Program: Part I – Introduction to Whole Farm Planning. Victoria Public Library from 9:30am – 12:00pm. 16 – Respirator Fit Testing: South Hill. If you require respirator fit testing, please be in contact Taylor Clarke at (434)-637-2863 for details. 17 – Introduction to Ground Source Heat Pumps: Appomattox, VA. Cost $20. Follow link for details. 17 – Respirator Fit Testing: Blackstone. If you require respirator fit testing, please contact Taylor Clarke at (434) 637-2863 for details. 17 – Brunswick County Buy Fresh Buy Local Meeting: Brunswick County Government Building Annex Auditorium. 19 – Cotton Production Meeting: Paul D. Camp Community College Workforce Center, Franklin, VA. Production meeting from 12:00noon – 4:00pm. Cost $10-$15/person. Lunch and commercial pesticide applicator recertification included. See flyer for details. 19 – Ag Supper Club: Wilson’s BBQ at 6:30pm. Dinner on your own. Topic to be announced. 20 – Beginning Farmer & Rancher Program: Part II – Marketing. Victoria Public Library from 9:30am – 12:00pm. 21 – Goat & Lamb Consignment Sale: Halifax County Ag Center from 9:00am – 11:00am. See flyer for details. Register your animals by Feb. 11th. 23 – Homeowner Fruit Tree Conference: Liberty Christian Church 149 Green Bay Road, Green Bay, VA from 9:00am – 3:30pm. Cost: $15/person. Lunch is included. See flyer for details. 24 – Charlotte & Lunenburg Private Pesticide Applicator Recertification: SVCC Keysville Campus, Workforce Building, from 6:00pm- 9:00pm. 26 – Area Beef Conference / Registration: Southern Piedmont AREC from 8:30am – 3:30pm. Cost $15. Registration form attached. 26 – Beginning Farmer & Rancher Program: Part I – Introduction to Whole Farm Planning. Heartland Regional Industrial Park Keysville, VA. See flyer for details and alternate locations. 26 – Prince Edward County Buy Fresh Buy Local Meeting at the Prince Edward Extension Office from 6:00 to 7:00pm. 27 – Beginning Farmer & Rancher Program: Parts III & IV – Victoria Public Library from 9:30am – 3:30pm. Lunch on your own. Farm Hand Needed outside Kenbridge – follow link for details. Hay for Sale – If anyone has hay for sale and would like to leave their information (type of hay, quantity, pesticide use, and contact information) with my office for those that call looking for hay, please contact me with the details. Private Pesticide License – I have had several requests for a private pesticide applicators study session and test for those who need their private license (for purchase of restricted use pesticides for use on the farm). If you, too, need your private license, please contact me and we will try to arrange a common time for the review and test. **First produce auction of the year in Cullen, VA: Vegetable starts, potted plants, and YOUNG FRUIT TREES (apple, peach, plum, and cherry!). Starts at 10am, get there before to browse and get an apple fry pie. 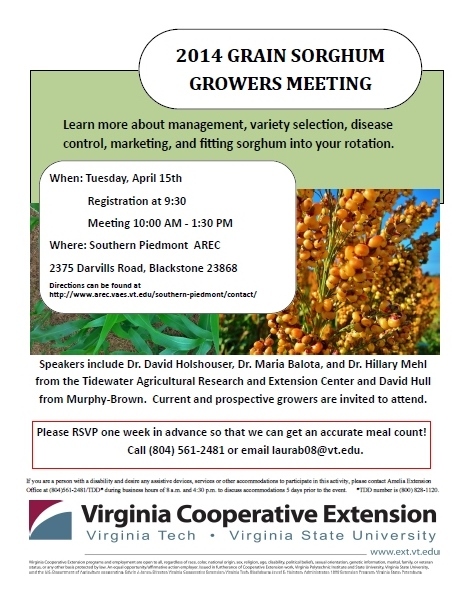 **Grain Sorghum Meeting in Blackstone, VA: Management, varieties, disease, marketing, and rotations. This was rescheduled from the snow day earlier in the year. 9:30am at the research station. Please let us know if you have not already RSVPed.